We've been on an I Love Lucy kick this month. It's not just a title, I really do love that crazy redhead. We all do, young charges included. The only drawback to too much Lucy is trying to get them to settle down at bedtime after they watch her brilliant oddball comedy. It's more of a hyperactivity catalyst then pure liquid sugar. It's making me laugh so hard that I actually get an ab workout. Hey, I wasn't even trying. One of the best episodes, hands down, is "Vitameatavegamin." Remember when Lucy gets sloshed practicing a commercial for the miracle supplement? She tells viewers that the alcohol-laden syrup contains "vitamins, meats, vegatables, and minerals." And that got me thinking about this Beef and Barley Soup in the Slow Cooker. It's got vitamins, meats, vegetables, and minerals. The only thing it doesn't have is alcohol, so you are guaranteed to stay warm, satisfied, and 100 percent sober. It's a cinch to make in your slow cooker, so fill 'er up today. "It's so tasty too; just like candy." Well, maybe that's a bit of a stretch, but it's spot-on if you leave out the candy part. Watch here for sore tummy muscles. Use any cut of on sale beef, even a pot roast, cut into 1 inch pieces. Beef bouillion cubes will work well here, just add less than you think you need and taste at the end and adjust. Got any leftover cooked vegetables-just throw them in at the end. Add meat through parsey to crock pot. Cook on low for 6-8 hours, or on high for 3-4 hours. Add barley for last hour of cooking. Stir in vinegar and sugar. Taste and adjust seasonings. PS Click here to vote for West's More Rockin' Morrocan Peanutty Pitas everyday through 2/12. Scroll down and register-it takes 10 seconds, promise! See yesterday's post if you have no idea what I'm talking about. PSS West just got an offer to appear on a morning show to make his recipe. He's decided to enter the witness protection program instead. very useful article. I would love to follow you on twitter. By the way, did anyone hear that some chinese hacker had busted twitter yesterday again. nice read. I would love to follow you on twitter. By the way, did you hear that some chinese hacker had hacked twitter yesterday again. I love all the wintery meals you've been posting, especially slow cooker ones. This sounds so good and I have some barley I've been wanting to use up. Thanks for all the recipes! I Love Lucy, too! Vitameatavegamin just might be my favorite episode. That or the candy factory one, or....yeah, it'a hard to pick, but I Love Lucy! And the soup look yummy! I have to do a "class" (The meeting formally known as Enrichment--ha, wish there was a symbol for it! ;) But I have to do a class about soups that use our food storage. This looks like a great one. I have barley! I like barley soup! MY mother loves making it for us. It is very timely for the cold weather. 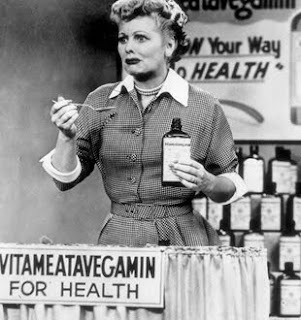 Vitameatavegamin and the episode when Lucy and Ethel work in the candy factory are the two best episodes ever! Do you have the cooking times and temperatures switched?? You say to cook on high for 6 to 8 hours, or on low for 3 to 4. Yes, anonymous! Thanks for catching it. I haven't seen many I Love Lucy episodes but I certainly remember this one :) This soup sounds so delicious and heart-warming, I will definitely be trying it soon! ahhh i love that episode! this soup looks really good, thanks. This is a good recipe. But -- it's even better when you add a quart of home-canned heirloom tomatoes from the backyard. You need to increase the amount of barley to compensate for the additional liquid -- but man oh man -- there's nothing like that creamy heirloom tomato taste combined with beef and barley. Good stuff. Two thumbs up. Bill, you lucky man! That sounds fantastic!